ICARIS is an innovative full grant lifecycle management module. It provides you with tools that allow you to track and monitor enquiries, applications, beneficiaries, and awards to ensure that your team follows the standard workflow procedures in handling them. ICARIS also enables you to process grant applications online. This reduces the data entry tasks of your administrative unit and makes it easier for potential beneficiaries to lodge their interest in your award. ICARIS offers you the means to process grant payments directly from your dashboard as well. Whatever actions you take in this module is instantly relayed to your accounts package, saving you the time and hassle of re-keying information. 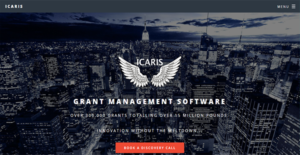 With more than 300,000 grants amounting to over 15 million pounds processed, you can trust ICARIS to aid you in finely managing your grant-making programs. To keep your foundation running smoothly, it is imperative that you keep healthy funds. That is why ICARIS lets you keep track of your awards and write-offs. You can view the details from your dashboard, where you can also produce BACS and checks. Moreover, ICARIS gives you the facilities to be flexible with your grant allocation. This means that you have full control over which awards receive funds and over recurring payments, as well as scheduled future one-off disbursements. ICARIS allows you to configure your case review workflow to ensure that cases go to the right decision-makers. With this, your team can make important decisions regarding applications and emergency issues easily and quickly. When you need to have a quick view of your organization’s current state of operations, you only need to check your ICARIS dashboard. Aside from being your control center for tasks, it displays vital information about your foundation’s status such as on your schedule of payments, your beneficiaries, and your caseworkers. ICARIS allows you to arrange your caseworkers’ schedules for them to accommodate an optimal number of cases within a certain time. This ensures that they work efficiently without being burned out. This also organizes case applications, reviews, and awards without having to recourse to paper traffic. Aside from giving you the tools to lighten your workload, ICARIS also makes it easier for interested individuals to lodge applications to your grants. The solution has a dedicated portal for them where they can send the required data and documents as well as check the status of their applications and awards. This gives them the transparency they need and reduces the calls to your administrative office for updates. With ICARIS, you can forget about redundant tasks. That is because the solution has automation and scheduling features that allow you to plan tasks ahead of time. This lets you focus on critical processes and the enhancement of your service instead of manual tasks. If you are considering ICARIS it may also be sensible to check out other subcategories of Best Grant Management Software gathered in our database of B2B software reviews. Since each organization has particular business requirements, it is sensible for them to abstain from seeking a one-size-fits-all perfect software application. Needless to say, it would be futile to try to find such a platform even among market-leading software applications. The intelligent thing to do would be to jot down the various important factors that require consideration such as key features, finances, skill levels of workers, company size etc. Then, you should do your homework thoroughly. Read some ICARIS reviews and check out each of the other apps in your shortlist in detail. Such exhaustive homework can make sure you reject ill-fitting platforms and select the app that provides all the elements you need for business success. How Much Does ICARIS Cost? ICARIS Grant Management is a comprehensive grant lifecycle administration program that is all in the cloud. You can request custom enterprise pricing from the sales team by phone or email. Alternatively, you can send your details to the company through the website contact form. We realize that when you make a decision to buy Grant Management Software it’s important not only to see how experts evaluate it in their reviews, but also to find out if the real people and companies that buy it are actually satisfied with the product. That’s why we’ve created our behavior-based Customer Satisfaction Algorithm™ that gathers customer reviews, comments and ICARIS reviews across a wide range of social media sites. The data is then presented in an easy to digest form showing how many people had positive and negative experience with ICARIS. With that information at hand you should be equipped to make an informed buying decision that you won’t regret. What are ICARIS pricing details? What integrations are available for ICARIS? ICARIS lets you integrate online applications and reviews to your website. If you need more information about ICARIS or you simply have a question let us know what you need and we’ll forward your request directly to the vendor.